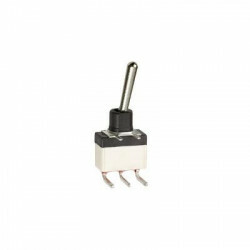 The 10600 series is a CECC approved single pole and double pole toggle switches including a 10mm diameter threaded bushing.Main features Threaded bushing 10mm diameter (.393)2 and 3 positionsSilver and gold plated contacts3 amp. rating. Single pole 1600-1700 series toggle switches with brass nickel plated lever.Main features Variety of actuator styles and colorsSolder lug or quick connect terminals2 and 3 maintained positions.